Programmed maintenance keeps Your equipment in peak operating condition, thereby reducing energy consumption. Our program will provide the proper maintenance tasking procedures that will include cleaning all heat transfer surfaces and calibrating your equipment to operate at peak performance. As we implement this Programmed Maintenance Plan, system efficiency is returned to an optimum level and operating costs and productivity losses are reduced to a minimum. Proper functioning equipment means money in your pocket. Proper functioning equipment means money in your pocket. Our Programmed Maintenance Program provides the manufacturers recommended maintenance tasking procedures for your equipment on a predetermined schedule. Our program reduces equipment failures, and costly equipment downtime while increasing employee productivity. Proper functioning equipment means money in your pocket. Our Programmed Maintenance Program provides the manufacturers recommended maintenance tasking procedures for your equipment on a predetermined schedule. Our program reduces equipment failures, and costly equipment downtime while increasing employee productivity. This program is designed to allow your equipment to operate within the original design environmental specifications they were engineered to provide. 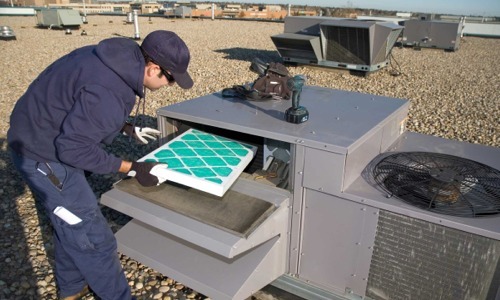 The first line of defense against possible perceived or real environmental complaints is proof of a verifiable maintenance program that provides for proper ventilation, filter changes and comfort control. Our program will help you meet these challenges while providing an environment that is healthy for your tenants. Consistent comfort control keeps your tenants happy which studies have shown increases productivity levels to peak performance. 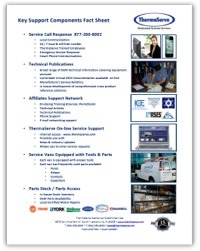 We have incorporated your business and technical requirements into this maintenance program. Our call center automatically dispatches the manufacturers recommended maintenance tasking procedures for your equipment on a predetermined schedule that best meets both your business and your equipment requirements. This maintenance program includes engineering support services to include identifying indoor air quality problems, solving comfort complaints, and or modifications to reduce or add air conditioning, heating or ventilation capacity in your facilities. As with this and any of our programs, we provide written performance guarantees with all of our engineered solutions. Our Programmed Maintenance Agreement has continuously proven to reduce emergency or trouble calls. However, when one does occur, you will receive our highest priority response. ThermaServe responds to emergency service or trouble calls even during peak periods within two(2) hours or less of your call from our four county office location area and within four (4) hours or less in our expanded regional area. Included in your program are air filter changes. 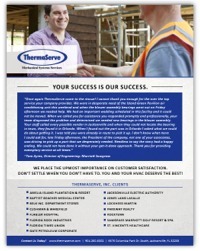 ThermaServe Inc. will provide the labor, materials, and removal of the used filters. Disposal of filters can be by ThermaServe or you to save money. 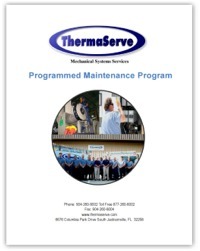 The main objective of this Programmed Maintenance Agreement is to maintain your equipment at optimum peak efficiency. During the course of executing the maintenance tasking procedures, our technicians are trained to identify impending problems and will recommend for repairs or replacement before they cause unplanned downtime. Even with the comprehensive care provided in this program, occasional failures can occur. Under this agreement, we will provide emergency response between scheduled visits, Monday through Sunday, including Holiday’s, 24 hours per day to minimize downtime. Even during peak heating or cooling periods, we will be on-site within 2 hours from receipt of your request. We will leak test and report needed repairs on any equipment found low of refrigerant. We will use proper refrigerant recovery procedures of your refrigerant as appropriate to minimize costs of replacement refrigerant. Such work will be done per all federal, state and local regulatory guidelines. We will document all scheduled and unscheduled service work showing the time, date, name of service technician, and equipment identification and brief description of work. This documentation will be made available upon request. We will meet with you annually or more frequently upon request to evaluate and make modifications, if necessary, to this maintenance program to assure that it continue to meet both your business and technical requirements.